Every lawn is different and therefore your lawn care treatments should be based on your lawns unique micro-climate. 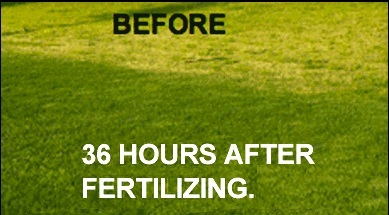 This is why we offer a truly customized grass treatment, weed control and landscape program . Our lawn fertilizing services uses a 7 step program that makes your yard healthy and the nicest in the neighborhood. We use commercial grade fertilizer and herbicides that are capable of controlling weeds making your lawn green, thick and healthy. We choose and apply only EPA approved products! During the growing season, we either use a granular or liquid application. Depending on the time of year and current climate, we choose products that will provide your lawn its best results. We use a 7 step program specifically customized to your yard. We offer one time lawn fertilization or regular services and do not require contracts. Milliken’s Irrigation strives to earn your business by offering great customer service, and of course, by making your lawn look fantastic. If you are not satisfied with any of our applications, you are provided a free service call. By scheduling timely applications spread out over 12 months, it ensures that your lawn remains healthy year round. • Pre-Emergents for weed control and prevention. • Balanced turf fertilizer with micro nutrients to feed your lawn. • We spot treat all weeds on every service call. With good mowing and watering practices, combined with our 7 step lawn fertilization and weed control program, your lawn should stay green, thick and healthy.